Above: Constituents gathering outside the chamber ahead of last night’s meeting. Outside council chambers last night Mick Liddle, of the prominent local Liddle family, was dismayed. He had come to council to hear about its decision on the Anzac Oval “change of use” survey results. Instead, like everyone else in the public gallery, he’d been given the brushoff. Left: Mick Liddle and Brenda Shields. From the floor, before the meeting got underway, Yvonne Driscoll had asked council what they were going to do about the survey result and “what we can do as a community to convince the Northern Territory Government that we are actually serious”. In the chair Councillor Jimmy Cocking told her that council would “seek to deal with some of those questions when we talk about that item later on”. It was clear that councillors had come to an agreement beforehand. The Mayor put his motion. Cr Cocking asked if anyone wanted to discuss it? No-one did despite the roomful of people waiting to hear from them. The motion was put to the vote, and supported unanimously, allowing it to be actioned today (instead of waiting for formal ratification the end of the month). “Can we ask questions, are we allowed to?” a dismayed Owen Cole asked from the floor. The committee had changed, from finance, to corporate and community services. Now Cr Jamie de Brenni was in the chair. “The survey, are you going to discuss the survey at all?” asked Mr Cole. “No, that’s the end of the matter tonight,” said Cr de Brenni. Mr Cole is a prominent business man and centrally involved in the planning for a National Indigenous Cultural Centre (NICC), a parallel project. “We’re disgusted by the whole thing,” he said when he got outside. “We Aboriginal people have been locked out again,” said Harold Furber, chair of the NICC group, having made similar comments within earshot of councillors inside. Mr Liddle was standing with Brenda Shields, also a local, born and bred. Did they feel locked out? “Very locked out,” answered Mrs Shields. What had she wanted from the meeting? “What’s this in the newspapers about 88%?” she asked, obviously confused by the NT Government’s claims about the Anzac Precinct site. “In three or four minutes it was closed. They didn’t say Anzac Hill,” said Mr Liddle. He went on to talk about the gallery consultation generally, not really distinguishing between the government’s process and the council’s. 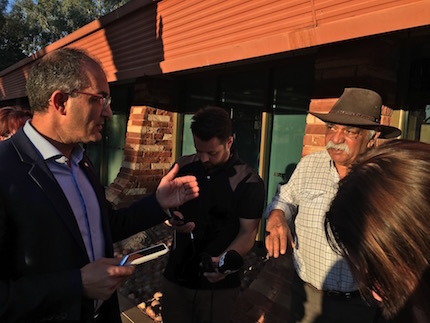 “From my point of view the whole thing is a farce and a scam … From the beginning Anzac Oval has been a priority, without consultation … a preferred site. A lot of people don’t want that. Meanwhile, another group formed around Cr Eli Melky, who sensing the confusion if not anger of the constituents leaving the public gallery, came outside to talk to them. Left: Cr Melky and Mr Furber; the ABC’s Nick Hose in the background, Ms Driscoll in the foreground . Ms Driscoll was interpreting the lack of any mention of the oval as “a good sign”. Why does the motion not explicitly exclude Anzac Oval? asked the ABC. “To keep the conversation going,” said Cr Melky. He said he would be happy “to personally move a direction” to be “very very clear” about council’s position. What he went on to say to this small group was rather different from what he said once he returned to the chamber (see last night’s report). To Mr Cole, Mr Furber, Ms Driscoll and others, he said: “We have no confidence in the government’s process of doing their consultation, we have very little confidence in the way the Michael Gunner government has led this from the start, but we as a council don’t want to be caught in a wedge, we don’t want to be the excuse for them not to keep a political promise to the electorate. “The art gallery is popular, we want it in this town. We don’t want it on Anzac Oval, that’s clear to us as well. And we, on your behalf as a community, are not going to vote for Anzac Oval to be used, but we need to keep the discussions going. “He never said there’s going to be any Aboriginal people in that discussion,” said another woman. “Council is not in that position,” said Cr Melky. “The committee structure doesn’t allow for that,” explained Cr Melky. “It should have been said at the start – this is the only opportunity to talk about it,” said the woman. 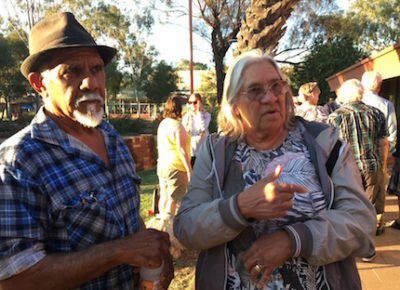 Meanwhile, if Aboriginal people interested in this issue were hoping for Lhere Artepe to represent their views to council, they would have been disappointed. Part of council’s process was for the Mayor to hold separate meetings with key stakeholders – concerned residents who have been vocal on the issues as well as a range of civil society representatives. Lhere Artepe CEO Robert Campbell “did not attend [his] scheduled meeting,” according to council’s report on the Anzac Oval consultation. The report does not record an apology from Mr Campbell. We should stop paying our rates in protest, have a delegation of Aboriginal leaders concerned and storm the Bastille, oops, the Council. We are left confused and not sure what is happening now.